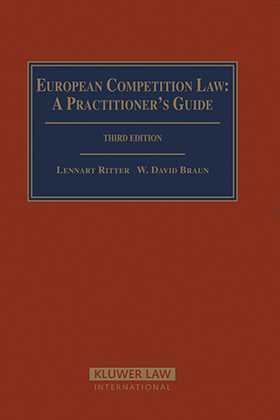 This Kluwer Law International guide fully covers the European Commission's assessment of distribution practices and vertical restraints, in particular the block exemptions granted by Regulations 2790/1999 and 1400/2002 Procedure before national competition authorities and national courts for enforcement of European rules under Regulation 1/2003. It also includes the Merger Control Regulation of 1 May 2004, the Transfer of Technology Regulation, and increased fines for hard-core cartel practices or abuse of dominant market position. Like prior editions, the work has no peer in its coverage of past administrative practice and the case law of the Court of Justice. All in all, European Competition Law will be of immeasurable value to practitioners who need to keep informed about how EC competition laws are applied, so they can continue to render practical, meaningful advice to firms whose agreements, transactions and conduct in the marketplace are governed by competition rules.